So in May my Dad helped pull-start the car. It took some doing but now it runs fine. 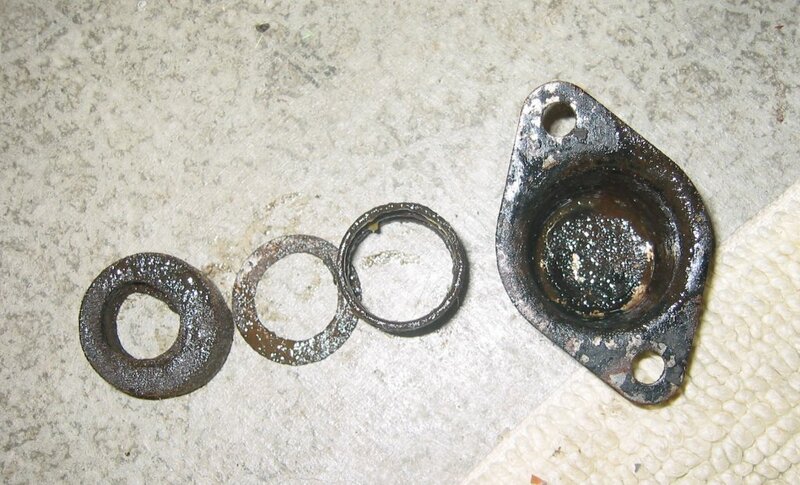 My best guess is some crap was stuck in the carb. 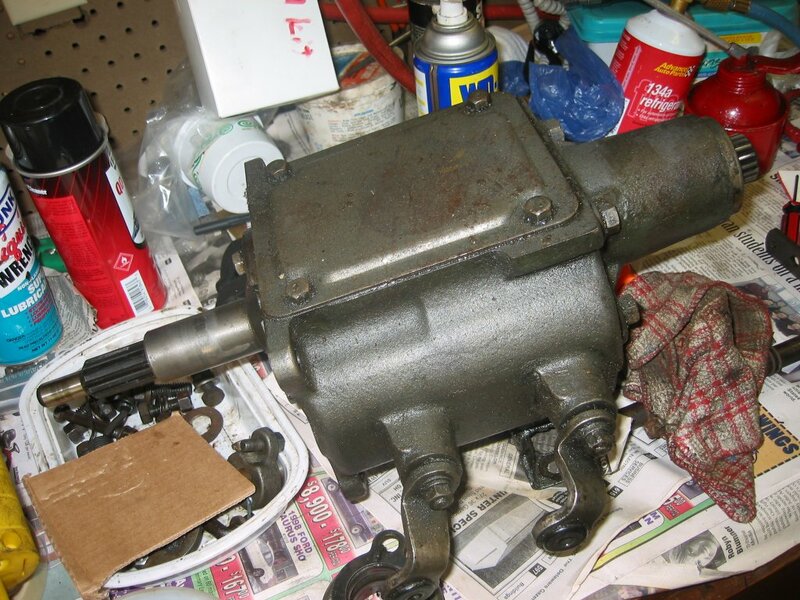 A carb rebuild is in this car’s future (as is a real fuel filter). I took the car for a spin, got gas, and then just as I was pulling the car in the garage the clutch pedal went soft and the car stalled out. I tried to start it but the clutch would not disengage. Yikes. The clutch itself was totally rebuilt around 1985 but has very few miles on it. 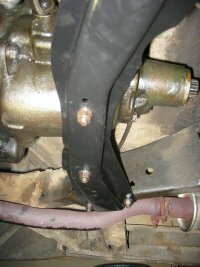 I figured the linkage was a likely suspect. 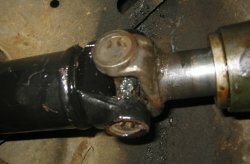 I crawled under the car and the linkage was intact but the operating shaft did not seem to rotate very much. My first thought was that the clutch throwout bearing had slipped off the levers that operate it. To figure it all out I decided to go ahead and pull the transmission to see what was up. 45 minutes later the transmission is on my bench. That was easy! The transmission fees like a new one. The bearings are solid and smooth. I was going to take off the cover but why mess with a good thing? To keep you oriented here is the exploded view of the clutch linkage in my car (a 3G in case you were wondering). I pulled everything but the actual clutch pedal and the shaft it pivots on. The diagram below shows the actual clutch. 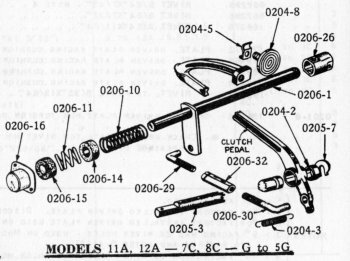 The end of the clutch operating shaft (0206-1 at left) is coupled to the lever shaft (0203-11 below) with the coupler (0206-26 at left). This coupler sort of acts like a universal joint to handle any movement between the engine and the frame of the car. 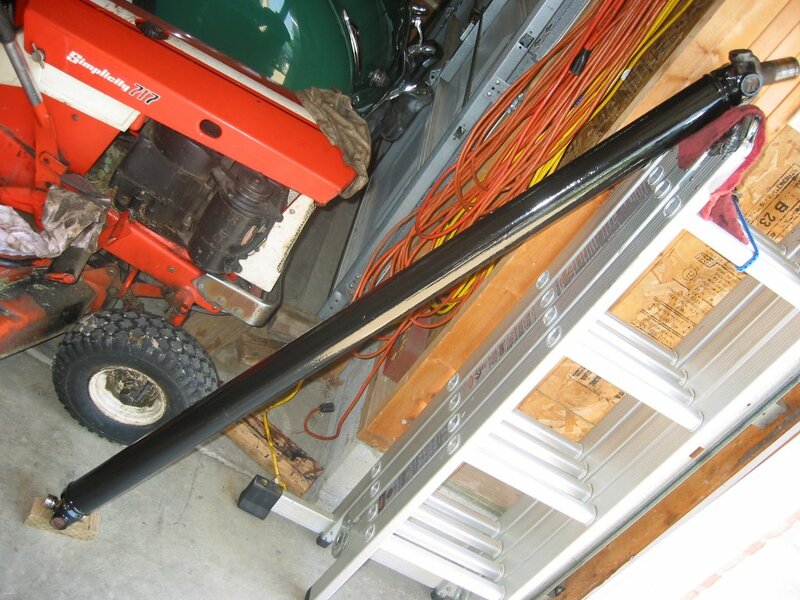 I cleaned and painted the driveshaft, rear motor mount and cross-member while I had it all out. The rust was almost non-existent but now we should be good for another 60 years. 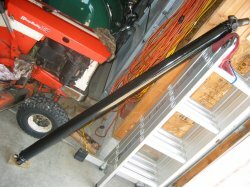 Here is the painted shaft leaning up next to my 1967 Simplicity lawn tractor (previously my oldest vehicle). Just about all the clutch linkage showed wear. This is the frame end of the operating shaft (206-1 in the exploded view). 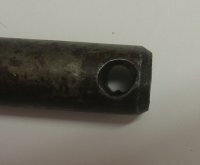 This end of the shaft just sticks though a hole in the frame is lubricated by a felt oil wick and cap that screws to the outside of the frame (more pictures below). 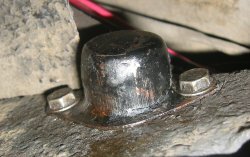 The wear here and in the frame are likely problems. 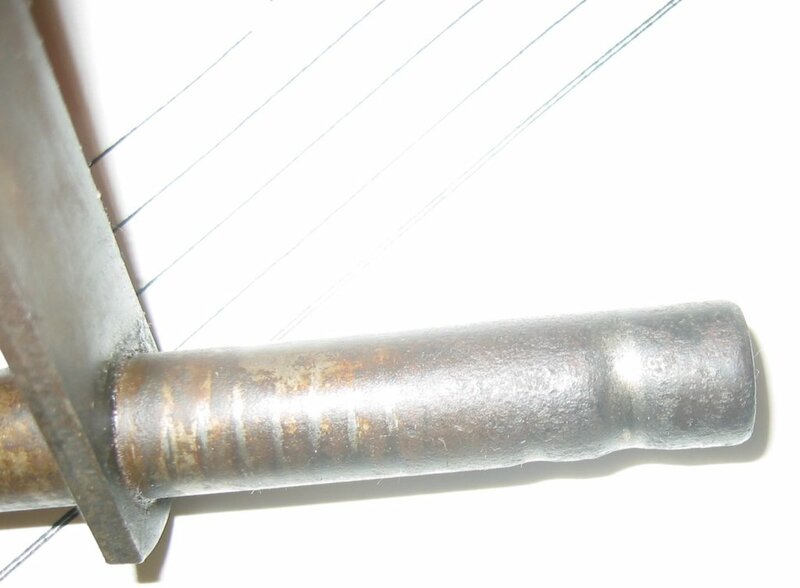 The levers on the lever shaft were worn as well (206-11 in the exploded view). 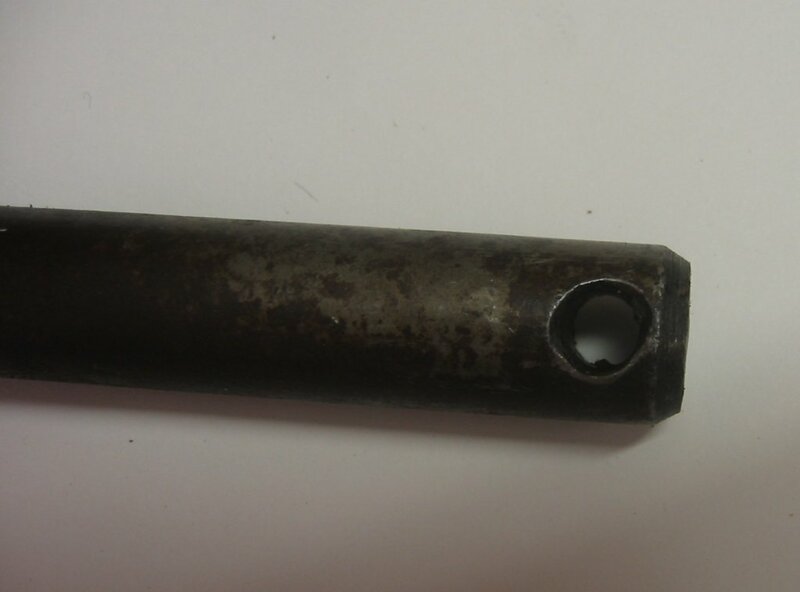 Both shafts and the coupler that joins them had wear in the clevis pin holes too. A lot of slop there! All these parts could probably be salvaged but I was able to find them at various Studebaker parts places for not a horrible amount of money. I figured I might as well replace anything worn while I can. Nobody is making more of these parts! I got the Lever Shaft (206-11 in the exploded view) first and the Operating Shaft and Coupler (206-1 and 206-26 in the exploded view) about a week later. 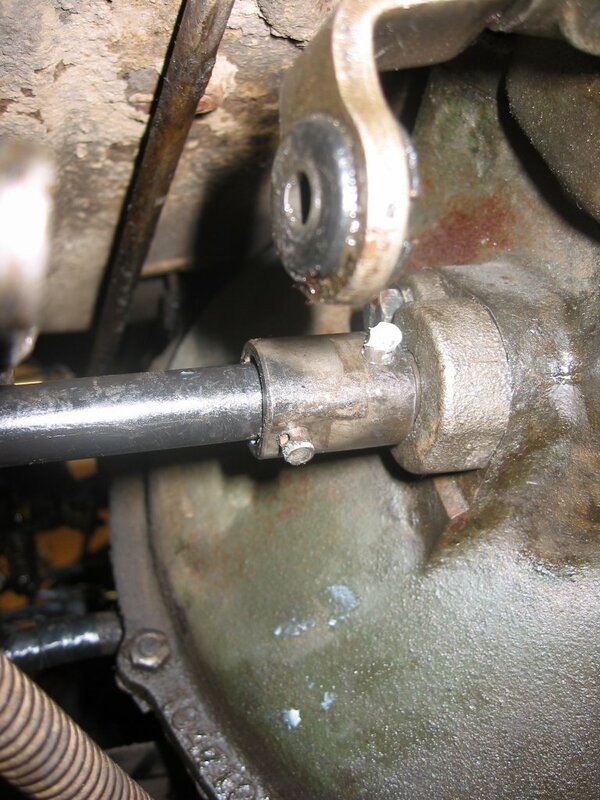 Here is the new Lever Shaft above the old one. 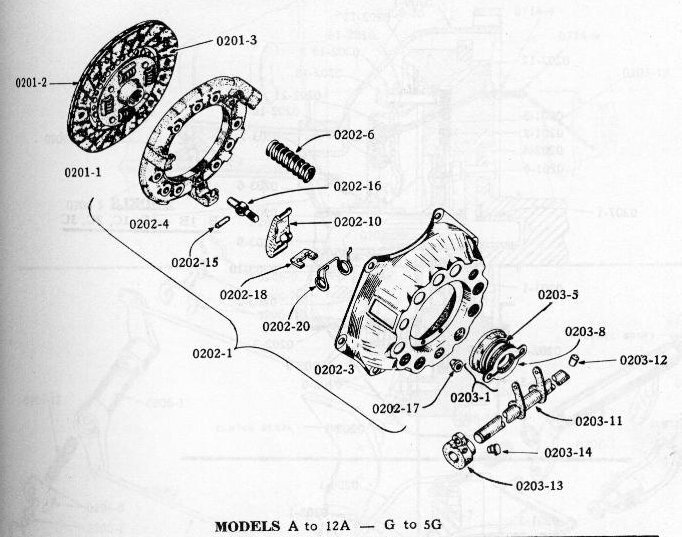 The throw-out bearing is in the upper left (203-5 in the exploded view). It looks like new–and it should as it was replaced when the clutch was rebuilt. 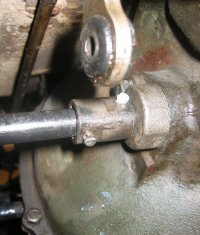 The bearing has a spring around it with two tabs that snap into holes in the levers on the shaft. 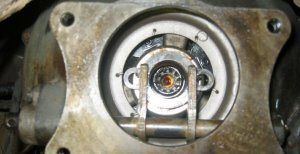 The bearing has a spring around it with two tabs that snap into holes in the levers on the shaft. 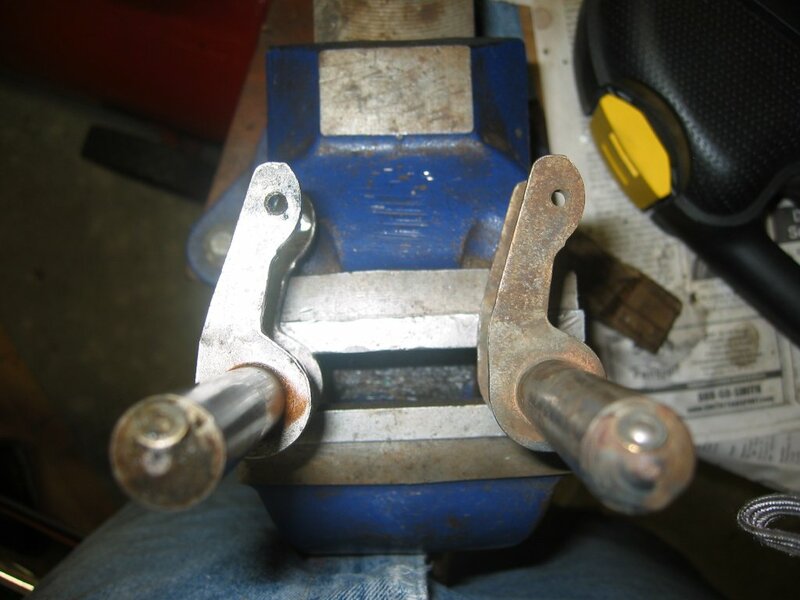 As the shaft rotates the round “nubs” on the levers push on the “ears” of the throwout bearing. 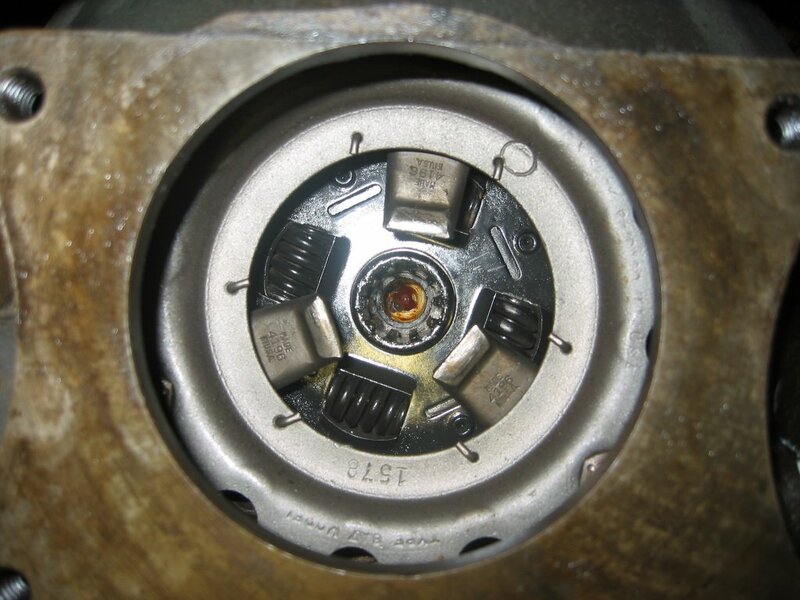 This forces the bearing against the pressure plate levers and releases the clutch. The picture at right shows the old lever on the left and the new one on the right. The new lever has more metal on the “nubs” and a lot less wear in the bearing mounting holes. 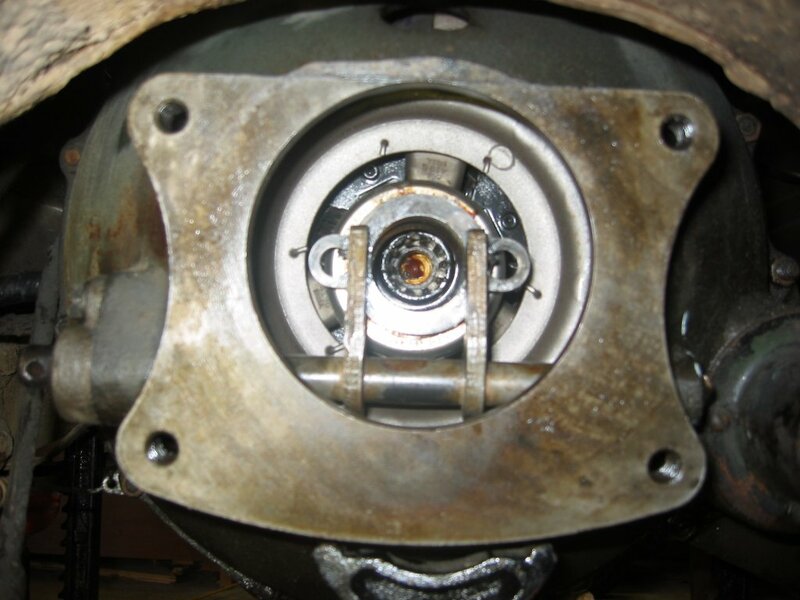 Here is the clutch looking into the bell housing from the rear. You can see the pilot bushing as a yellow circle in the very center. 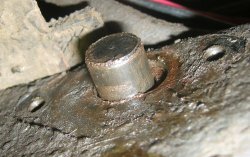 That is pressed into the flywheel and supports the main shaft of the transmission. The black metal and springs are the actual clutch disk (0201-1 in the exploded view). The three levers that the bearing pushes on to operate the pressure plate can be clearly seen. This all still looks like new. 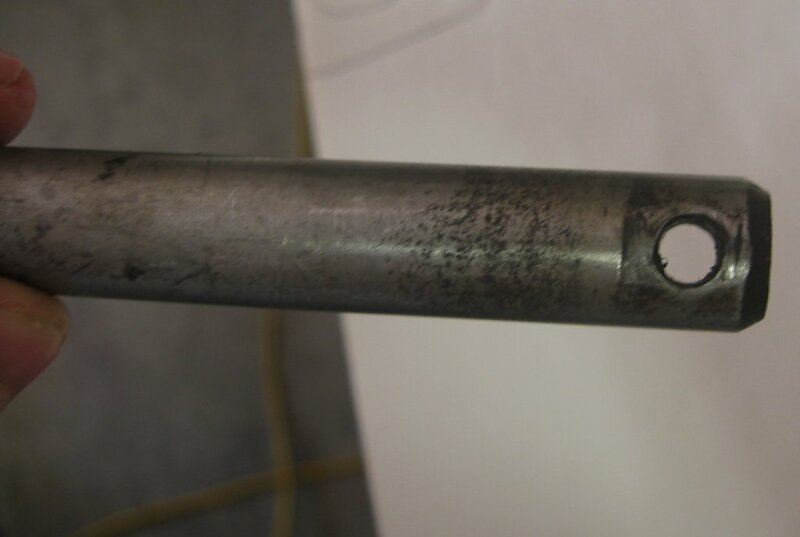 Here is the same shot with the Lever Shaft and Throwout Bearing installed. The bushings that the shaft pivots in feel really good. I half expected them to be really worn. At this point I was stuck for a couple of days waiting for the Operating Shaft. Finally I got the new shaft. The new one is on top. It looks so nice because I painted it. The lever on the new shaft is attached differently than the one on the old shaft. I have heard these had a nasty habit of rotating on the shaft and causing the clutch to fail. I could not get mine to rotate but maybe it did in the past because the old shaft is at a slightly different angle than the new one. Just in case I scribed the new shaft so if the lever comes loose I will know where it belongs. 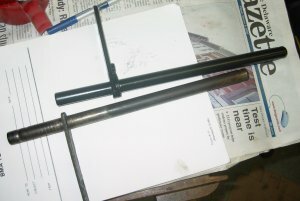 Here on the left is the frame end of the new shaft installed. You can see the felt oil wick against the frame. Next comes a washer. The washer was a minor chore. The old one was pretty rusted and worn so I took a big standard washer and shaped it to fit with my drill press and angle grinder. 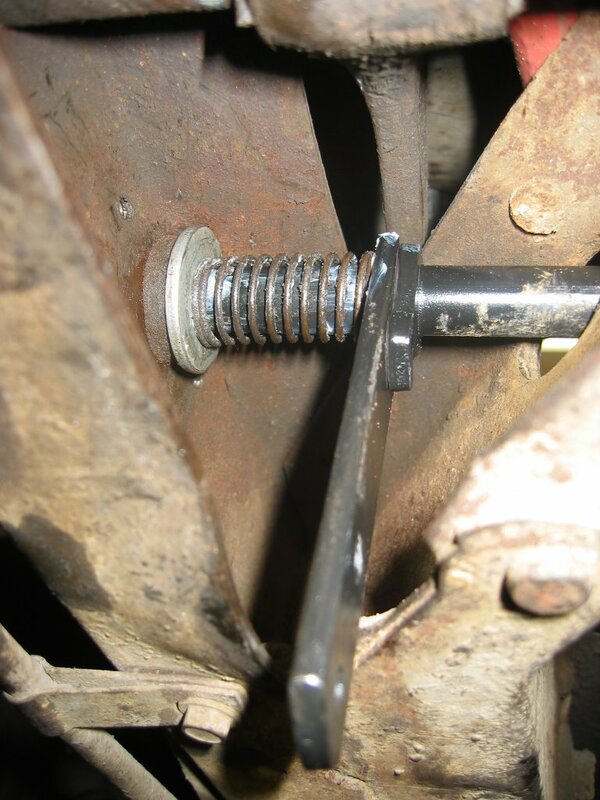 The washer serves as the mount for the spring that keeps the linkage tight so it does not rattle around. On the right is the other side of the frame rail. You can see the hole is quite oval. I thought this was wear at first but it seems too even. 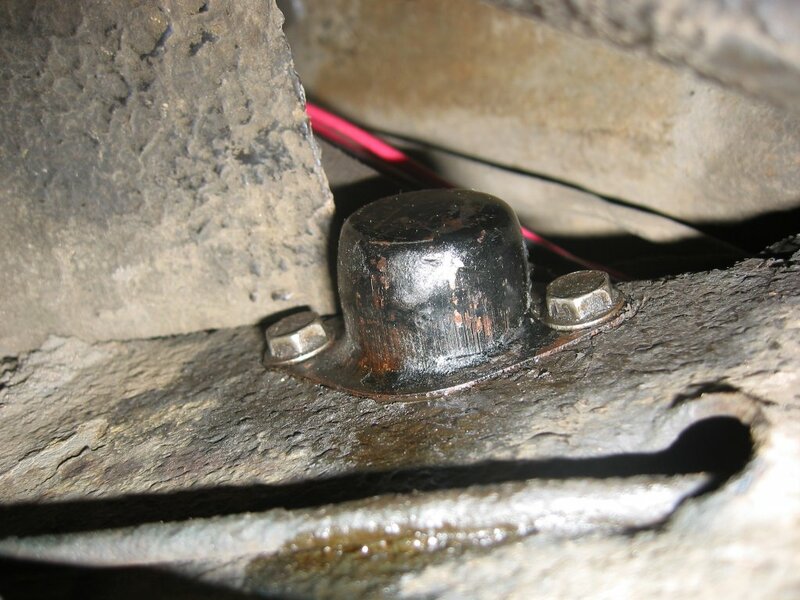 If I have future problems this is an area I will check closely.Another felt oil wick and end cap enclose the end of the operating shaft outside the frame rail. The other pictures show the parts spread out and installed. 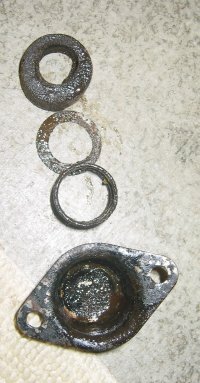 At left you can see the felt oil wick “doughnut”, a thin washer, the spring, and the cap. The lower right shows how all this is installed. Next I re-installed the transmission and hooked up the clutch linkage. 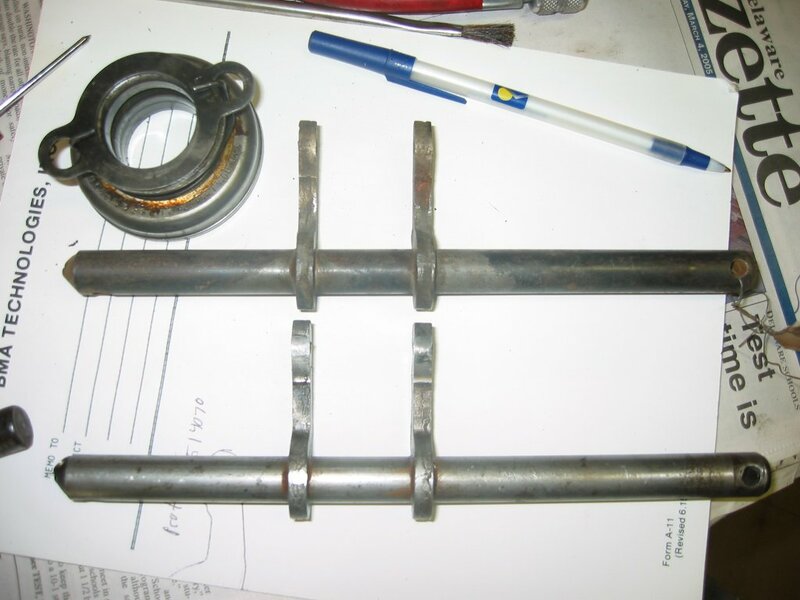 The picture at left shows the coupler attaching the two shafts together. 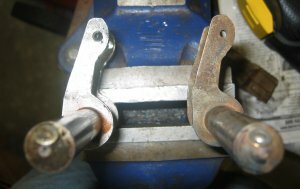 The clevis pins are in place but I had not yet installed the cotter pins to hold them in. At right is a view looking forward along the frame rail. You can see the turnbuckle (206-29, 206-30, and 206-32 in the exploded view) that ties the clutch pedal to the operating shaft lever. 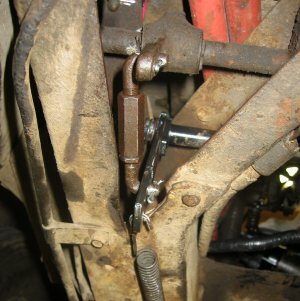 This turnbuckle is also how you adjust the linkage. 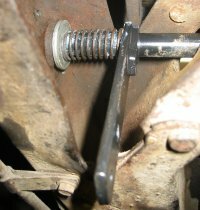 I also have the return spring in place that helps return the pedal to the full up position when the pedal is not in use. Here I just re-installed my cleaned and painted crossmember and rear transmission mount. The rubber in the mount seems solid enough. Amazing it has held up so well. 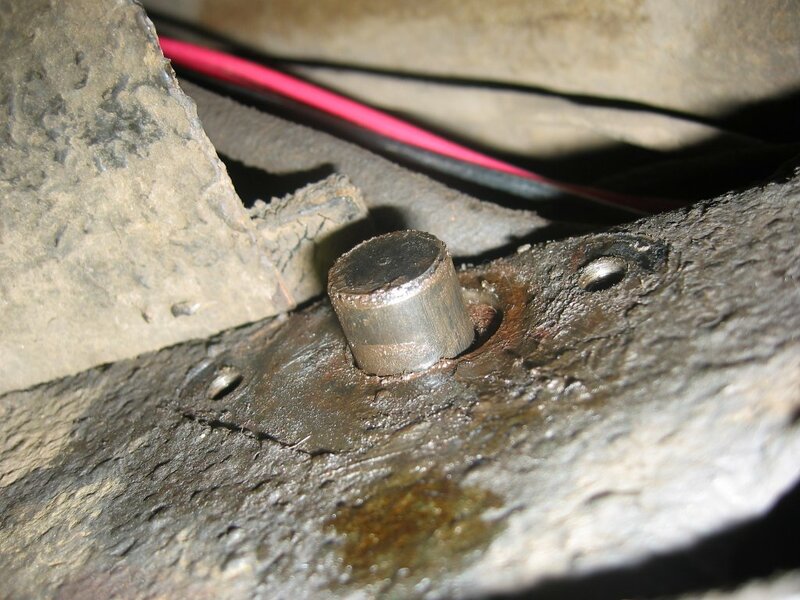 Once these bolts were tight I took the jack out that has been supporting the engine. 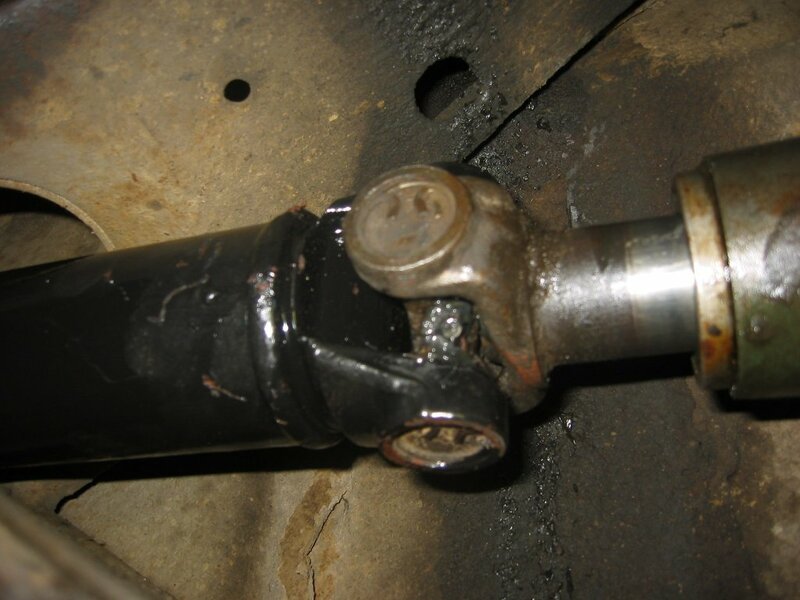 Finally the driveshaft goes back in. 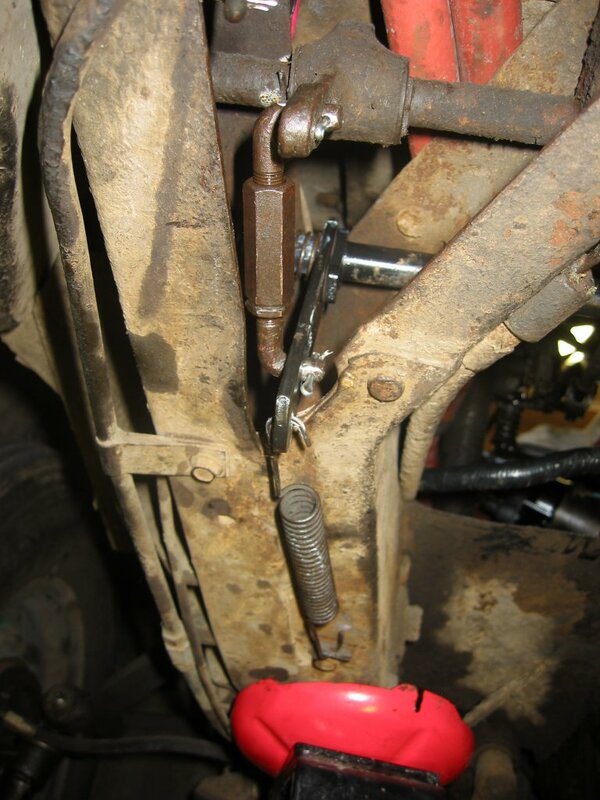 Before I did this I tested the clutch by turning the transmission tailshaft with the transmission in gear. I could not turn it with the clutch out and could turn it with the clutch in. Successful test!Once I got the car off the jacks I started it up and tested the clutch again. It seems good. I am nervous that I did not find a “smoking gun” that caused the clutch to fail. 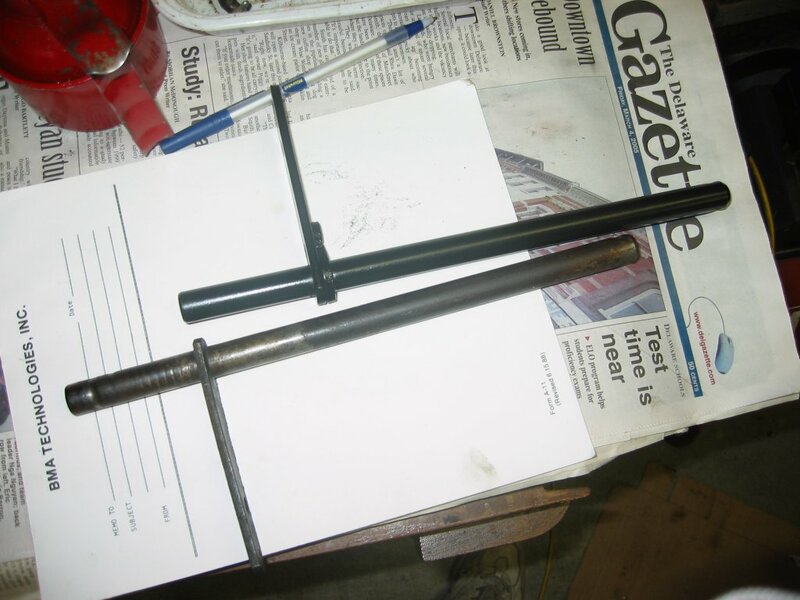 I sort of suspect that the old operating shaft finally wore enough to shift in the frame rail. 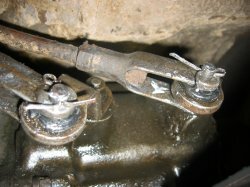 My only other theory is that the throwout bearing got hung up on the levers in spite of the spring clip holding it in place. I don’t know but I drove it 10 miles this morning (6/11/05) and it seems to work great. Found your project very interesting as well as educational. We are working on a ’32 1 1/2 ton Studebaker flat bed truck that is used on an educational farm (Wagner Farm) near Chicago. Your detailed explanation of your clutch project gave us a big boost on our learning curve. Any help in providing us parts suppliers would be greatly appreciated.